Marc attended the Australian Geoscience Council Convention (AGCC 2018) in Adelaide this week. He presented on ambiguous amphiboles and put up a poster on climbing natural wonders. Abstract for the NOA presentation and a copy of the poster appear below. What should we do about naturally occurring fibrous amphiboles: do they pose the same health risk as asbestiform varieties? Asbestiform amphiboles are listed as a Group 1 carcinogens by the International Agency for Research on Cancer (IARC). They include asbestiform varieties of riebeckite (crocidolite), cummingtonite‐grunerite (amosite), tremolite, actinolite, anthophyllite, winchite and richterite. It is likely that other asbestiform amphibole varieties have similar adverse health effects. Amphiboles have a wide range of mineral habits and may show variation from columnar, fibrous and asbestiform habits, sometimes in a single specimen. Tremolite schists in Ordovician meta-volcanics in central NSW mainly comprise fibrous tremolite-actinolite. They are associated with tremolite asbestos occurrences, and small quantities of asbestos were mined from narrow vein deposits in this area last century. When pulverised the host tremolite schist releases mineral fragments that fall into the classification range for countable mineral fibres and may be classed as asbestos, despite not having an asbestiform habit. The ambiguity in classification of this type of natural material raises significant health and safety, legal and environmental issues that require clarification. While the health effects of amphibole asbestos fibres are well known and procedures are in place to reduce the risks, the consequences of exposure to non-asbestiform, fibrous varieties is not well studied. This group of minerals deserve more attention due to their widespread occurrence in metamorphic rocks in Australia, and their potential disturbance through mining, civil construction, forestry and farming practises. Toxicological studies for instance would improve our understanding of the risk of exposure. Climbing Geological Wonders: Myth and superstition are preventing our enjoyment of the natural world. Marc attended the 61st AEG Annual Meeting/13th IAEG Congress in San Francisco, California on September 15-23, 2018. He presented 2 papers on Natural Occurrences of Asbestos and sat on an international panel of experts during the 3 day NOA symposium. A feature of the meeting was discussion of the potential health implications of elongate amphibole fibres and non-regulated asbestiform minerals. This is an area of on going research. The excursion to the recently completed Calaveras Replacement Dam site was a highlight. Construction of the dam required a high level of management, monitoring and control of asbestiform glaucophane derived from Blue Schists disturbed by major excavation works. Photo shows blue schists being quarried for rip rap. Work undertaken under a NOA management plan. 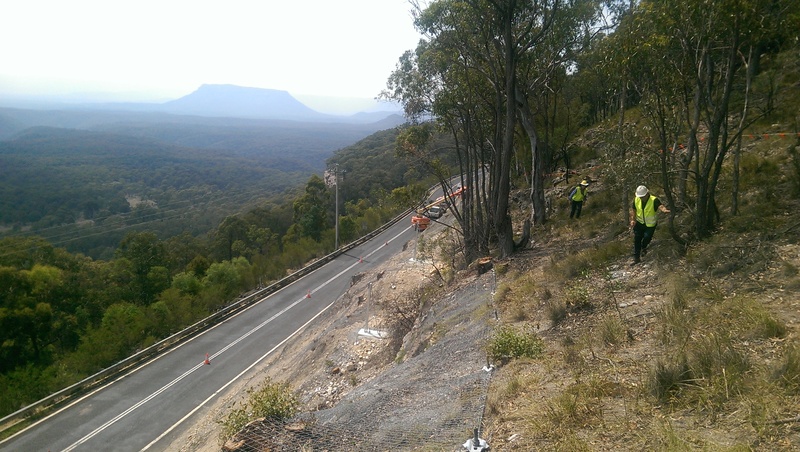 We just completed design and supervision of slope remedial works at Pearson’s Lookout on the Castlereagh Highway, north of Lithgow. One of a number of slope jobs completed over the last 12 months. Design features on this one included installation of pinned rock fall mesh on the batter and construction of a Geobrugg GBE100A-R barrier at the crest. The views from this site over the Capertee Valley are extraordinary. Recent investigations on Tremolite Chlorite Schists from the Byng and Rockley Volcanics around Orange (see photo) and Dog Rocks in central NSW indicate that if pulverised (eg used as a gravel) this rock releases countable mineral fibres. These tremolite fibres have a fibrous rather than true asbestiform habit but meet aspect ratio and mineralogical rules to be counted as asbestos. The question is whether or not they have the same toxicological properties as asbestiform tremolite. Toxicological studies are required on this material and I’m hoping to learn a little bit more about the methodology and more on current work being done with fibrous minerals by attending the European Mineralogical Union School 2017: Mineral fibres: crystal chemistry, chemical-physical properties, biological interaction and toxicity. The school is being held at the Università di Modena e R.E. and Prof. Alessandro F. Gualtieri is the lead organiser. ABC news tonight featured a report on recent Naturally Occurring Asbestos (NOA) issues in NSW. Following a radio interview with Local ABC we thought we would add a few notes. Photo showing asbestiform tremolite in narrow slip fibre vein. The risks of asbestos exposure from natural sources of asbestiform minerals is generally very LOW. The risk of exposure increases if rocks containing NOA are significantly disturbed. This generally requires pulverising the rock to release respirable fibres. This may take place if NOA bearing rock is crushed to create aggregates, or disturbed during major earthworks, for instance during road construction activities or during mining. Living next to undisturbed outcrops or walking over, or camping next to rock outcrops containing NOA is not a significant risk. Air quality studies have shown no detectable levels of fibre in such circumstances. A NOA management plan can reduce the potential for exposure. Key to this is recognition of NOA in the first place. This requires a geological assessment. The Heads of Asbestos Coordination Authorities (HACA) have recently released a map showing NOA potential of rock units in NSW. The map is based on a desktop study and rates rocks as LOW, MEDIUM and HIGH NOA potential. There is no guarantee that rocks in these areas will contain NOA. Only a site visit by an experienced geologist and testing can confirm the presence of NOA. There are some issues with the map, but is of great use in helping to identify areas potentially at risk. The map may be accessed via a NSW government website. In using this make sure you turn on all the layers. (Click on the layers tab, then click the asbestos drop down -arrow on RHS, then click “STATEWIDE – GEOLOGICAL UNITS WITH ASBESTOS POTENTIAL” and check all the boxes). In its report ABC make the claim that: “…naturally occurring asbestos (NOA) which is present in about 1 per cent of the state.” This is substantially incorrect. In fact the HACA map report indicates just 0.83% of NSW of outcropping units have been assigned a NOA potential. This is a potential, NOT an actual occurrence. There are only a small number of known NOA occurrences, and only a few historical asbestos mines in NSW, the largest of which was the Woodsreef mine in northern NSW. The map is an assessment of the geological potential based on geological factors such geochemistry and metamorphic and structural history. Of the 0.83%; 0.56% is LOW potential, 0.16% is MEDIUM potential and just 0.11% is HIGH potential. 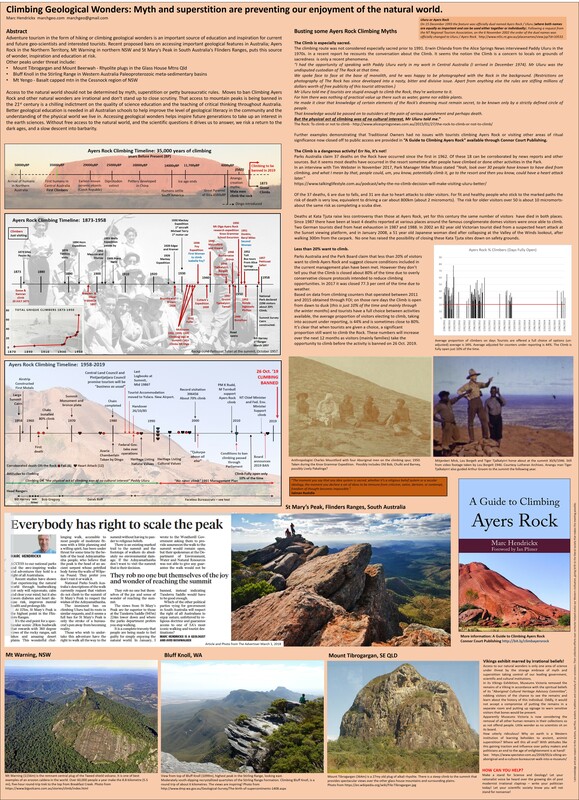 For the HIGH potential areas, which are the main problem, only a very small percentage of the rock (typically <1%) is likely to contain any asbestiform minerals. NOA occurrence in LOW and MEDIUM potential areas is contentious and in many cases field inspection and detailed geological assessment indicates the classification is not warranted. ABC state “The risk posed by NOA is similar to when it is in its bonded form, such as building materials.” This is not true. Manufactured Asbestos Products (MAPs) contain asbestos fibres that have already been processed from the host rock. Hence asbestos products, like asbestos cement sheeting, already contain fibres that are of respirable dimensions. It only takes minor disturbance to liberate respirable fibres from MAPs. Rocks containing asbestiform minerals bound to the rock generally require substantial disturbance to release fibres and more disturbance to produce fibres that are respirable. Further information is available through our NOA page. See also the material on the SAFEWORK NSW website. Based on knowledge of the geology of asbestos in Australia and medical studies that have established NOA as a source of exposure elsewhere, the risks to the general population in eastern and South Australia from exposure to fibres from natural sources is negligible. Only those outcrops close to human settlements that have undergone significant long term anthropogenic disturbance through mining, quarrying, excavation or repeated disturbance through ploughing are considered a risk of releasing fibres in quantities large enough to be considered a significant health risk. In eastern and South Australia, such outcrops are generally in areas of low population density. Rocks containing asbestos that have not been disturbed are probably not a significant source of asbestos fibre. For such outcrops there is no mechanism that can release individual fibres in sufficient quantities and size that would make them bio-available. A key factor is that if asbestos is not disturbed and fibres are not released then it is not a health risk. The overall message about the risks of NOA in eastern and South Australia can therefore be summed up as “No need for alarm”. Government authorities should take similar precautions to reduce the risks of exposure for all forms of asbestos regardless of the source. In areas where potential asbestos-bearing rocks and soil occur, planning authorities need to seek additional geological and geotechnical advice to reduce the likelihood of unplanned disturbance of asbestos-bearing materials. With engineering controls in place there is a safe means of working in these environments. The derivative geological maps and associate information produced in this thesis provide a means for non-geologists in planning positions in local, state and federal governments to properly manage development in areas of natural asbestos-bearing materials thereby avoiding future accidental disturbance of NOA. If you have any questions about NOA, particularly those geological in nature please contact Marc on 0406320248. The NSW Heads of Asbestos Coordination Authorities have released a new information product on NOA that includes new NOA potential maps for NSW developed by the Geological Survey of NSW. The maps have three potential classification levels. Low Medium and High. 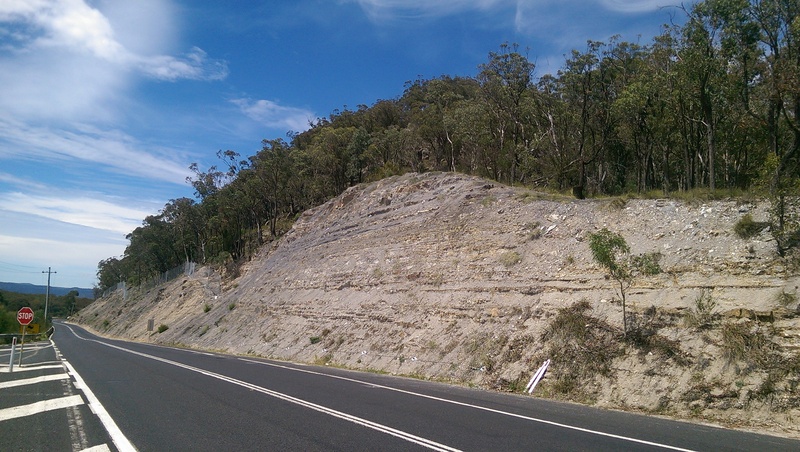 Regions of high potential are mainly serpentinite belts, these rocks are known to host asbestos occurrences in NSW. The Medium and Low potential categories however often include rocks with no known asbestos occurrences and the classification is subject to significant uncertainty. We have found that some areas classified as medium and low potential include rocks that have the same potential for asbestos as areas classified as having “no potential”. A low or medium potential classification may result in significant costs to comply with asbestos management regulations unless further geological investigations are undertaken. Field checking of low and medium potential areas provides a means to justify re-classification of areas to reflect conditions on the ground. If you need mapping done to clarify NOA potential on your property make sure you talk to us first. We were asked to present at the 2015 NSW RMS Geotechnical Conference held at the Power house Museum in March. Subject of our talk was on the geotechnical aspects of the recently completed slope works at Clyde Mtn on the Kings Highway. Kings Highway is the main link between Canberra and the NSW coast at Bateman’s Bay. The section of the highway across the top of Clyde Mountain, east of Braidwood follows a route laid out by Sir Thomas Mitchell in the 1850s and cuts through very steep, densely forested terrane. The road in this section has a long history of instability and is affected by landslides from above and embankment failures below. The main landslides above the road have their origin in construction works in the late 1950s and early 1960s, where widening the road to a modern standard undercut unfavourably inclined meta-sedimentary rock strata. This provided the potential for large scale planar failures on bedding to occur. The first landslide event involved about 30,000m3 and occurred on December 15, 1959 while widening works were in progress. Another landslide of about 5000m3 occurred on October 28, 1993. At this time workers installing concrete drains at below the slope reported the mountain groaning and observed small rock falls. A subsequent engineering inspection found an open tension crack above the slope. The road was closed and the slide occurred an hour or so later. On April 20, 2012 a smaller slide of about 930m3 occurred following heavy rain and damaged rock fall fences. On Tuesday June 25, 2013 a section of the crest of the 1993 failure slipped following a >200mm rainfall event resulting in about 600m3 coming to rest against the existing rock fall fence which burst in a number of sections but prevented most of the landslide debris reaching the road. In addition to these larger failures smaller rock falls and slips are common but generally go unreported. The area has also been affected by embankment failures below the road with repairs undertaken in 1975. Prior to the early 2000’s the only preventative measures in place were a series of light weight rock fall fences. These were replaced in the early 2000’s by a series of RMS Type 3 rigid rock fall fences with an estimated capacity of about 350kJ. At the same time a series of draped mesh installations, shotcrete and rock bolts were installed to reduce landslide risk. Following the 2012 event RMS engaged Marchgeo to undertake an investigation to better understand the geology, history of failures and to develop remedial measures to reduce the likelihood of failures affecting the road over the short to medium term. The large landslides are planar failures on bedding planes best developed where the road and bedding are parallel. Where there is a slight difference in orientation, potential wedge style failures dominate. Rainfall is a major factor in triggering some of the slide events, but lack of an onsite rain gauge (until recently) has made it difficult to match historical events to precise rainfall figures. The study highlighted the importance of keeping accurate records of past failures, with the dates of previous slides being obtained from third party sources. Remediation focused on reducing the likelihood of further large slides. This was done in two stages in 2013 and 2014. Initial work involved extensive de-vegetation, hazard mapping, and extensive scaling with blasting, machine and hand tools. The 2013 landslide occurred during this period of works. The second phase involved further development of the scope with the main construction phase of long term measures occurring between April-September, 2014. Works included installation of a series of reinforced shotcrete toe buttresses pinned back into the slope with long rock anchors that cross cut potential failure surfaces, along with additional scaling, spot bolting and shotcrete. Draped mesh (Geobrugg – Deltax) was used to control small rock falls across the slope. In addition to reducing the likelihood of small rock falls reaching the road the mesh is intended to reduce the rock fall risk to workers involved in clearing debris from behind the fences. Prior to the mesh being installed the fences were subject to puncture damage from high velocity impacts from small rock falls that contributed to a loss of capacity over time. The mesh now prevents these high velocity impacts and helps extend the life of the fences that were also extensively repaired. Repair of a fill embankment downhill from Pooh Bear corner by soil nailing was also undertaken as part of the remedial works. 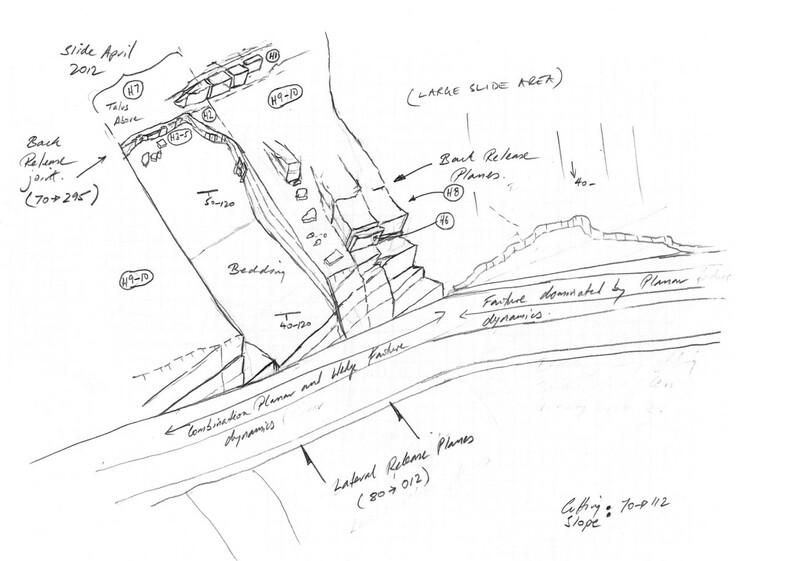 Clyde Mountain: simplified geotechnical model for 2012 failure zone. New Landslide maps for US state…where are ours? In NSW we don’t have an up to date Engineering Geological map of our State’s capital. It is long overdue for a series of detailed Engineering Geology maps to be produced for the states larger population centres! Interesting results on new sources of NOA from Nevada. It would be worth looking at similar igneous systems in Australia. Malignant mesothelioma has been found at higher than expected levels in women and in individuals younger than 55 years old in the southern Nevada counties of Clark and Nye, likewise in the same region carcinogenic mineral fibers including actinolite asbestos, erionite, winchite, magnesioriebeckite and richterite were discovered. These data suggest that these elevated numbers of malignant mesothelioma cases are linked to environmental exposure of carcinogenic mineral fibers.